In the summer of 2014 we started working with RH Live – a leading UK wedding and function band agency who had experienced massive success in the past, before being penalised by Google. RH Live had held the top spots on Google UK for the big head keywords such as function bands, wedding bands etc and developed a business that has excelled across the country and internationally. When I was approached by RH Live with the news of a complete lack of Google traffic and consequently a lot less business, I was keen to get on board and help out with my SEO services. With a relatively limited budget the goal was to first identify the nature of the penalisation and discuss with the client about the background of the website and any potentially damaging activity carried out on the domain. It turned out that old SEO tactics had been employed and consequently run the website into the ground. Hundreds of bad links had been built to the site and resulted in a Google Penguin penalty. Our job was to manage the backlink profile and perform a backlink audit with disavow submission to let Google know we are trying to deal with the issue and want to be disassociated with the linking sites. After this was dealt with, it was time to analyse the state of the onsite SEO to see if the site has also been penalised for any bad onsite tactics. When looking into the state of onsite SEO it was clear there was a lot of issues that would have made an onsite ‘Panda’ penalty very likely. One of the worst offenders was tens of pages for different locations across the country. Example – a Brighton Wedding Band page, London Wedding Band page etc, all with duplicate content and only the location keyword changed on each page. This is a pet hate of Google’s and is one easy way to get penalised. We refined the list of locations that the client really cared about and then I crafted brand new text for each page. This started to reduce the worst issues, whilst I also deleted location pages for areas the client didn’t care about. After tackling both the fundamental offsite and onsite SEO issues, we started to see improvements by December 2014. 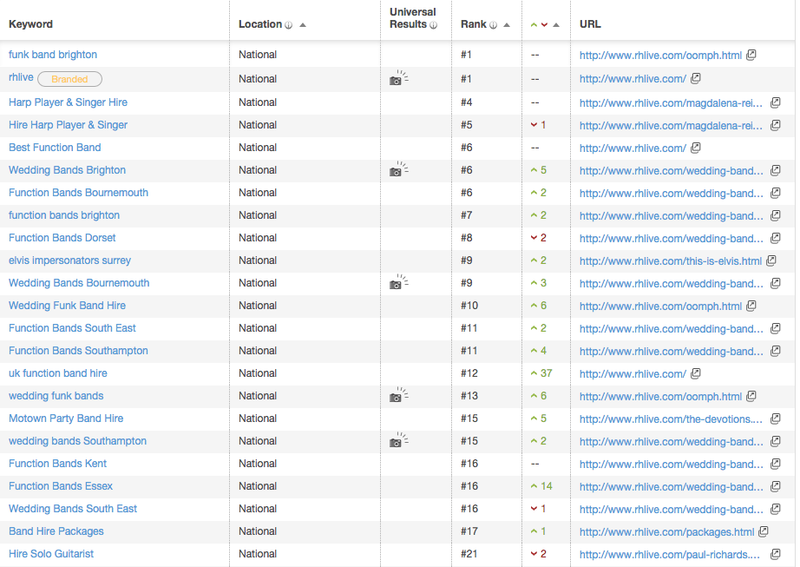 These signs of a start of recovery came when we saw a set of tracked keywords rising up in the rankings. 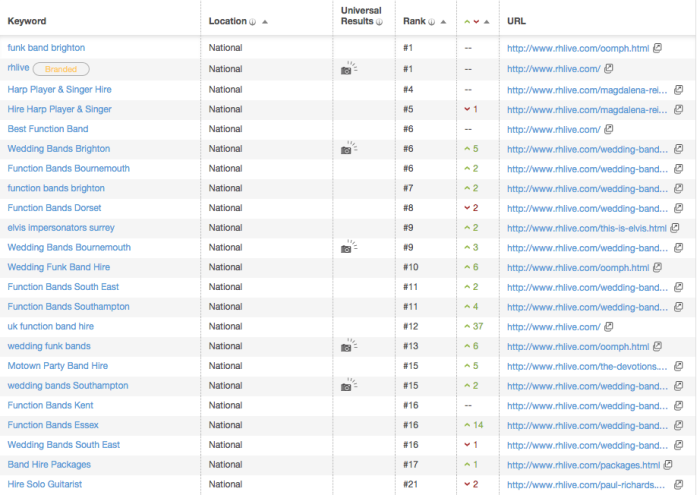 From a set of around 50 keywords tracked, we saw 37 improve from the previous week and 16 decline. Most of the keywords now on page 1 of Google were on pages 2-6 before the work was carried out. The recovery process is not overnight and we expect to see the rankings continue to improve as Google gains more trust in the website. If you have a wedding or function band (or agency) and want to improve your organic traffic then let us know. If you want to learn more about the broad range of SEO services we offer, then browse through our SEO page.